WARNING: Video above contains graphic footage that may be distressing to readers. 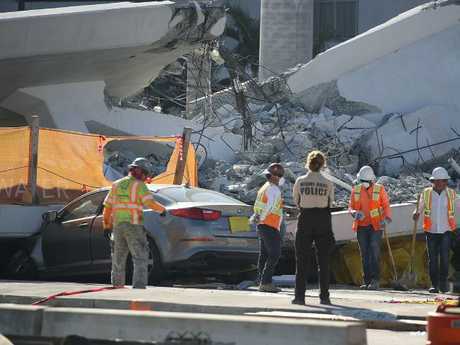 AN ENGINEER from the company responsible for building the pedestrian bridge that collapsed at a university in Florida on Thursday reported cracks two days before the tragedy. 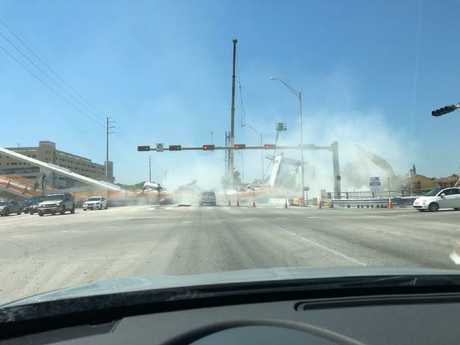 Miami Herald reports that FIGG Bridge Group employee, Denney Pate, called the Florida Department of Transportation (FDOT) on Tuesday and left a voicemail mentioning cracks at one end of the bridge, but dismissed any safety issue. The FDOT released a transcript of the message on Friday night. In the message, Mr Pate said he was calling to share "some information about the FIU pedestrian bridge and some cracking that's been observed on the north end of the span". He added that it's at "the pylon end of that span we moved this weekend". He continued, saying that the bridge has been looked at and "obviously some repairs or whatever will have to be done, but from a safety perspective we don't see that there's any issue". "We're not concerned about it from that perspective although obviously the cracking is not good and something's going to have to be, ya know, done to repair that," he says, before asking for someone to call back when they can. The FDOT claimed that the voicemail wasn't heard until Friday morning - after the bridge had collapsed. So far six people have been reported dead, with the search for others buried in the rubble still underway. 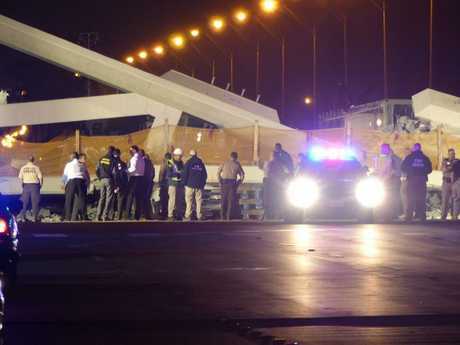 A Florida International University freshman is the first fatality to be named after a pedestrian bridge collapsed onto a road in Miami on Thursday. 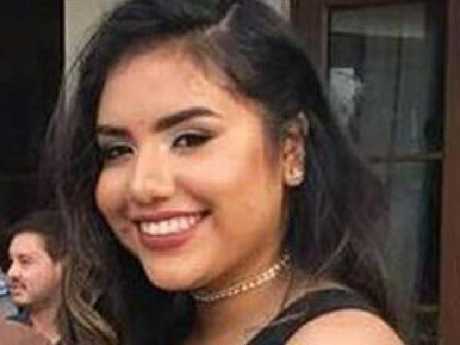 Alexa Duran, 18, was a political science major at FIU, and at the moment of collapse she was driving below the bridge in her grey Toyota SUV, with a friend in the front passenger seat, the Miami Herald reported. According to the New York Post, Ms Duran's friend, Richard Humble, was able to get out of her car. But he could not free her, said another friend, Manny Perez. Mr Humble is in stable condition with neck and leg injuries, the Herald reported. "The way the bridge fell, it fell on the driver's side," another friend, Lynnet Gomez, had told the Herald on Thursday, as she and Perez waited at the campus for word of their friend. Mr Duran was in London when he heard about the accident and is making his way home. "This is going to be the longest and saddest trip of my life. I don't want to return." Authorities have yet to confirm the sad news. 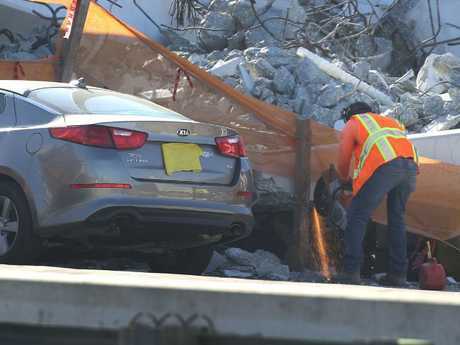 Jorge and Carol Fraga drove from West Palm Beach, fearing their relative's car was trapped beneath the bridge at Florida International University. 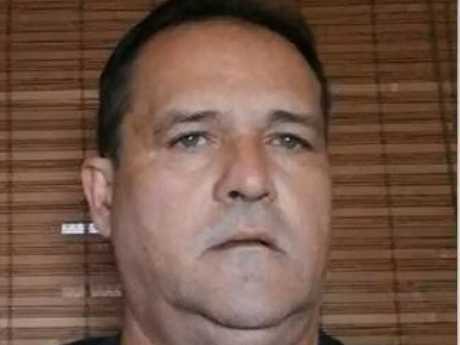 Sixty-year-old Rolando Fraga, Jorge's uncle, lives in the area and frequently takes the nearby turnpike to work, but no one has heard from him since midday Thursday. "The waiting is so ... I don't have words for that," Carol Fraga said through tears. "I want to find out for sure if it's him out there," Jorge Fraga said. "They saw the car - his Cherokee. We don't know exactly his whereabouts. He got missed 12 o'clock on. It seems it could be him, but (we're) not sure." Miami-Dade Police Department Director Juan Perez said he understood it was an agonising wait for families. "We know that there's people missing, the family members know that there's people missing, and what we can tell them is that we can assume that they're in there," Mr Perez said at a news conference. After searching the site with sniffer dogs, police have determined that no one would be pulled out alive, Mr Perez told reporters. Mr Perez said that his agency's homicide squad is leading the investigation. "We've got to look at the reality that there may be some negligence down the line," Mr Perez said. 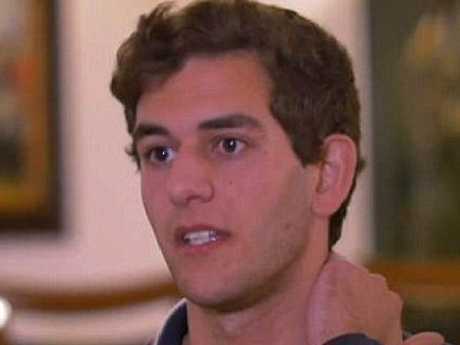 "It will help determine whether someone is liable for this ... It's obviously an accident either way. We have to look to see if somebody contributed to that accident." 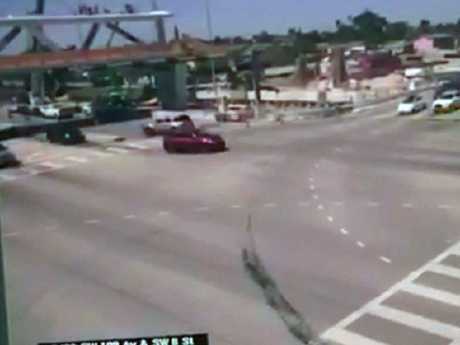 It came as a harrowing video revealed the moment the Florida bridge plunged on to a busy freeway, landing on eight cars below, "crushing them like sardine cans". The video, which appears to be filmed by someone looking at a screen with the security camera footage, was posted on social media. 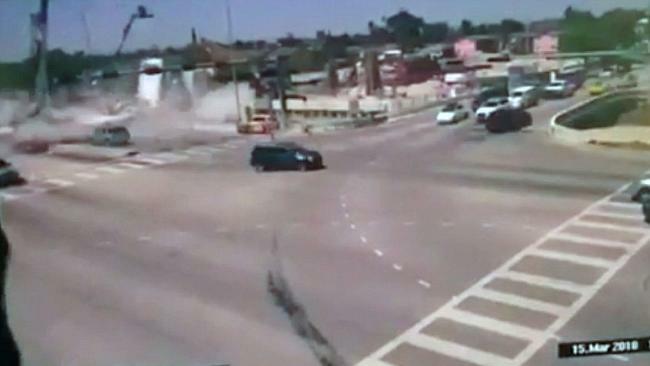 The footage shows how the bridge suddenly collapses on the road. People can be seen standing on the bridge as it crumbles and hits the ground. The footage emerges after Miami-Dade Police say the death toll from the horrific tragedy has risen to six people. Detective Alvaro Alvaro Zabaleta said the operation has turned from rescue to recovery. "There is the possibility - the sad possibility - that under the concrete there may be additional vehicles," Mr Zabaleta, adding that engineers fear the support structures at either end of the structure could fail. He said they can't yet release any information about the victims. He said 10 people were initially hospitalised. As Florida authorities work to identify the people who died in the catastrophic bridge collapse, state and federal investigators will begin the task of figuring out how and why the five-day-old span failed. 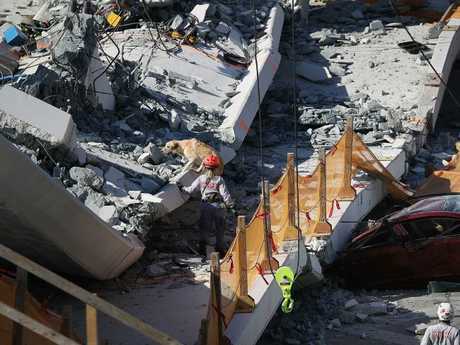 Miami-Dade County Fire Chief Dave Downey said that his crew is using hi-tech listening devices, trained sniffing dogs and search cameras in a race to find anyone still alive in the rubble. The $A18.3 million pedestrian bridge was supposed to open in 2019 as a safe way for students to cross the busy road. It linked the community of Sweetwater with the campus of Florida International University. Aerial footage at the site showed a trained dog running atop fallen concrete and sniffing in the crevices for any victims. 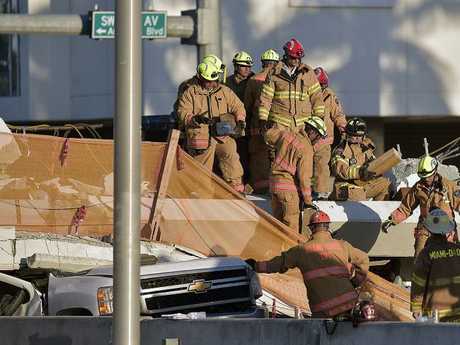 Miami-Dade Police Director Juan Perez acknowledged the likelihood of finding more victims under the rubble is slim. He also said the main priority is getting to the victims in crushed vehicles under the rubble as quickly as possible. "The fact that we know that there are bodies down there and we can't get to them, it's just horrible," Mr Perez told a local radio station. He said an updated number of fatalities would not be released until all the remaining victims are found and pulled from the debris. 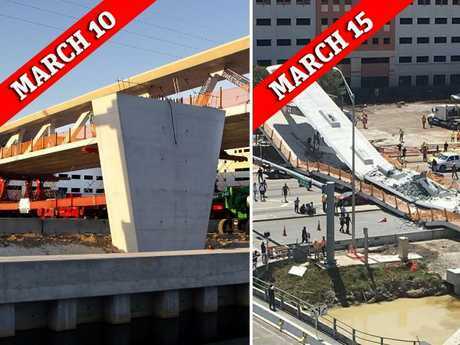 The six-day-old, 53m-long, pedestrian walkway opened last Saturday outside Florida International University was reportedly undergoing a stress test when it collapsed at 1.30pm local time. The 950-tonne bridge was erected in just six hours using a technique describe as Accelerated Bridge Construction, according to the university. The bridge was not opened yet when it collapsed on vehicles waiting in traffic. Florida congressman Carlos Curbelo said he had been told a stress test was under way when the bridge collapsed. Authorities said construction workers atop the bridge were among the casualties. "There was some testing taking place, and it is a very good question that must be answered - why more precautions weren't taken before conducting this type of stress test if indeed that was the case," Mr Curbelo said. Witnesses said the cars were stopped at a traffic light when the bridge collapsed on top of them. "Our teams are in search and rescue mode, they are still searching the debris." Restaurant owner Lianet Sado, whose business is nearby, said her husband tried to help two construction workers who were tied by their harnesses to the top of the bridge. She described a devastating scene as she told how she and her staff tried to help people who were trapped in their cars. 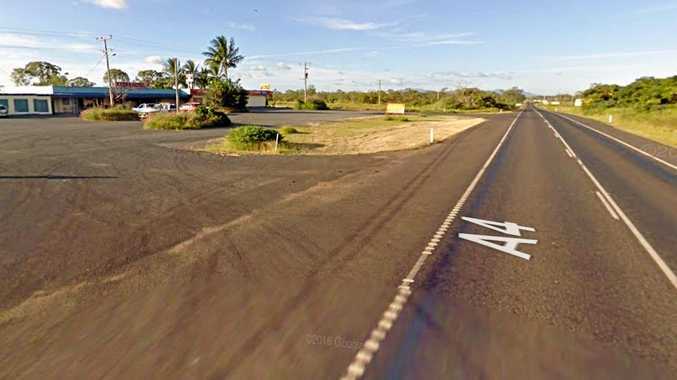 "There was a car that was completely crushed at the front, so it was probably safe to assume unfortunately that the driver and the co-pilot were both crushed completely," Ms Sado said. "But then there was this young boy in the back of the car with pool of blood and just basically begging for someone to help him. "That is basically something that I am not going to be able to get out of my head because I am a mother of a kid and I just that boy with his hand out the window, just crying for help. "The police officers arrived and they told me that I couldn't be under the bridge to help this person." Ms Sado said she moved on, feeling powerless, and tried to offer more help to other victims. A fire and rescue spokesman said more than 100 firefighters, search and rescue teams and live search dogs were combing the wreckage of the bridge for "viable victims". 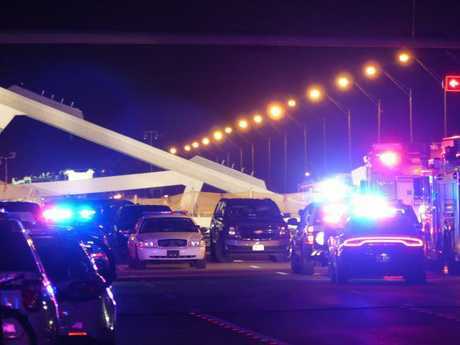 Florida Senator Bill Nelson said it was "tragic" and "ironic" a safety bridge installed to protect students trying to cross a busy six-lane freeway had collapsed. The company that designed a pedestrian bridge that collapsed in Florida is the same company that designed the new bridge in Minnesota, after the old span collapsed more than 10 years ago. The engineering company is FIGG Bridge Group. Its new pedestrian bridge in Miami was hailed as a technological innovation before it collapsed on Thursday, killing at least six people. The bridge was designed to withstand a Category 5 hurricane, the most dangerous measure by the National Hurricane Center, and built to last 100 years, the university said. In 2007, the Interstate 35W bridge collapsed in Minneapolis, killing 13 people and injuring 145. After that tragedy, FIGG was selected to design the replacement bridge that's currently in use.